If you're thinking about getting another horse, there are plenty of factors to consider. 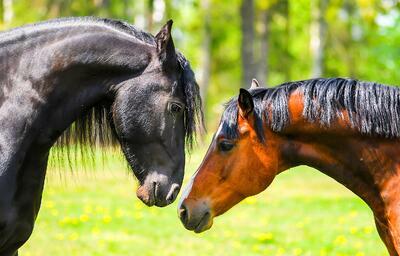 You are probably wondering whether your horse will get along with a new horse. Perhaps you are worried your current horse will be hostile or ignore the new addition. Would your horse even like the company? While there are many who only keep a single horse, if you have the financial means to purchase another, you'll likely find the benefits outweigh the cost. Here are just a few of the reasons why your horse needs a companion. Horses enjoy the company of fellow horses. They are herd animals. Because of this, they prefer to stick together. If you were to head on out into the wild, you would find horses congregate in small herds. They typically feel more secure when surrounded by other horses and have lower stress levels than horses isolated from other animals. Keeping horses together also reduces their boredom. Perhaps more importantly, having multiple horses decreases the chances they will engage in destructive actions like chewing on wood and stall walking. Even the addition of a single horse has the potential to improve your current horse's emotional and physical well-being. It’s worth noting, however, that stallions should never be with another horse. Geldings and mares, however, do well with companion horses. Horses truly appreciate the presence of companions. If you go to a trail ride or a show, your horse won't feel nearly as lonely if another horse is next to him. Though horses certainly appreciate the presence of human beings, it is just not the same as the presence of another horse. Similar to people, horses are in search of stability and a social homeostasis of sorts. Adding a new horse gives your current horse a point of familiarity. He will always have his buddy by his side regardless of where he is taken. Horses place trust in their herds. Though adding a second horse will not qualify as a genuine herd, it will certainly help your horse adjust to the demands of travel and constantly being uprooted from his home. Introduce them gradually. This method involves keeping the horses where they can see one another but cannot touch. After they've grown accustomed to one another from afar, move them into neighboring paddocks. You should still keep a watchful eye on your horses, as they may strike, bite or kick through the fence. If the horses have no scuffles, you can put them together. Introduce them all at once. With this technique, you simply place your new horse in with your current horse and let them sort things out for themselves. This method is most effective on horses that are submissive in temperament. Dominant horses are more likely to lash out. If you use this technique, make sure the horses have enough space to get out of each other's way if fighting should occur. If you introduce a new horse and he does not immediately get along with the rest of your horses, don't give up. Allow the horses some time to get used to one another. Each horse has a unique personality. It might take some time for your horses to get used to the presence of a new companion. With another horse in the picture, your arena will need extra care. Help your arena footing last for years to come. Download our FREE Arena Footing Whitepaper below.